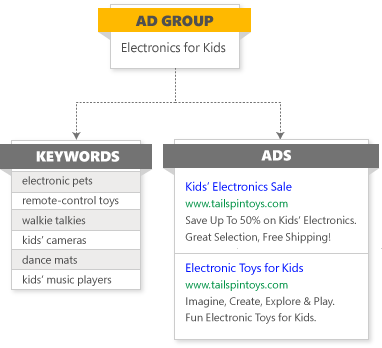 Learn how keywords work with ad groups and how to add keywords. Keywords are the words or phrases that you associate with your ads so that potential customers who are searching the web can find your ads. Keywords could be shoes, beach resorts, or acting classes in New York. If you have a keyword that matches what someone searched for, there's a better chance they'll see your ad. To better understand keywords, you need to know about ad groups. Ad groups are the best way to organize your campaigns by the specific products or services that you offer. When you create a campaign, think about the different kinds of ads you want to create. For example, if you’re a toy retailer, you might want to write ads for kids’ electronics and different ads for your tricycle and wagon products. This is where ad groups come in. Keywords in the first ad group might include walkie-talkies, electronic pets, and kids’ music players. The second ad group might include keywords like pull-along wagons, tricycles, and kids’ bikes. If you don’t create separate ad groups within your campaign, people searching for "kids' bikes" might end up looking at your ad for electronic pets and vice versa. Use ad groups to help make your ad more relevant to users’ searches and to improve your ROI. Click Campaigns located at the top of the page. Click the Ad groups tab. Click Create ad group and enter Ad group settings, including ad group name, language, and location. While keywords get your ads in front of the right people, negative keywords keep them from showing for searches that won’t likely lead to sales. For example, if you’re a toy retailer running a sale on kids’ electronics, you won’t want to pay for search traffic from people looking for other children’s toys. In this case, your negative keywords can include dolls, board games, and puzzles. Make sure to spend as much time perfecting your negative keywords list as you do your keywords list. Click Campaign or Ad group. Select the appropriate campaign or ad group, then add your negative keywords as appropriate. To add an exact match negative keyword: red flower, you would enter [red flower]. To add a phrase match negative keyword: red flower, you would enter "red flower". It is only when initially creating your campaign or ad group that you use the hyphen. Outside of that, when adding additional negative keywords to an existing campaign or ad group, as described in this page, you do not use a dash. Rather you use quotes or brackets. When you add negative keywords to a campaign that has multiple ad groups with different language and market settings, Bing Ads adds the negative keywords only to ad groups that have the same language setting as the account. If you want to do more than guess what people are searching for, use the Bing Ads Keyword Planner to get keyword ideas and suggestions for your campaigns. The tool helps you find the most relevant keywords for your target customers and suggests bids that will help get your ads seen. On the top menu, click Tools and then click Keyword Planner. Click Search for new keywords. Enter up to 200 products or services that are associated with your business. You can enter a single keyword, or several separated by commas. You can also enter the URL of your website or a specific page on your website. This will impact keyword suggestions, historical statistics, and traffic estimates. For more information, click on the question mark (?) next to Targeting in Keyword Planner. Optional: Enter negative keywords, separated by commas. Words you enter here will not be included in keywords that are suggested to you. You can set the start and end month to get the search volume trends and data for the specified time range. Optional: If you want to narrow the suggestions down to only keywords that contain certain words, enter those words in the Search options section. You'll get ad group and keyword suggestions with historical statistics, like monthly search volume trends and data, competition, suggested minimum bid, and ad impression share. You can also change the graph's data by selecting Search volume trends, Mobile trends, Breakdown by device, Breakdown by location, Compare to competitor domains, or Compare to market leader domains from the dropdown menu above the graph. You'll also see two tabs below: A tab for suggested keywords and a tab for suggested ad groups to organize those keywords. Be sure to look at both. After reviewing the recommended ad group and keyword suggestions, you can Add selected to estimates or Export the suggestions. Learn more.